A tunnel has been discovered in a Mexican prison, stashed with drugs, alcohol and sharp tools, according to local authorities. 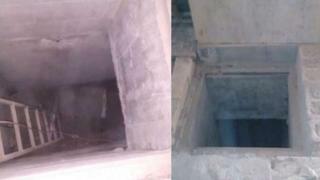 Police in Tamaulipas state said the hole, which had been hidden by bricks, was up to five metres (16ft) deep. They said it was unfinished and no one has escaped. In 2015, one of the country's biggest drug lords, Joaquin "El Chapo" Guzman, escaped via tunnel from Altiplano prison. He was recaptured after six months on the run and later extradited to the US. The latest hole was in a jail in Reynosa, a city close to the US border. It was found after authorities used geothermal technology to detect activities underground, according to local media. In March, 29 inmates escaped via a tunnel from a prison in the Tamaulipas state capital Ciudad Victoria. One of the prisoners who fled was involved in the 2012 kidnapping and murder of Karen Alejandra Rodríguez. He was later recaptured, but the victim's mother, Miriam, who had been campaigning for justice for Mexico's missing people, said she lived in increased fear after the escape. She was shot dead in her home last week by an unknown assailant. Mexico also saw another major prison break in the country's north-west in March. Juan José Esparragoza Monzón, son of one of the country's other drug kingpins, escaped from a jail in Culiacán, Sinaloa state, alongside four other inmates. His father, Juan José Esparragoza, was a long-time partner of El Chapo in the Sinaloa Cartel, one of the country's biggest crime syndicates. Monzón remains on the loose. Tamaulipas police said on Sunday that they were conducting a search for further holes after the latest tunnel was discovered on Saturday night. They said that Reynosa prison was operating as normal and visiting hours had resumed.